Last week was a busy spring week filled with multiple fun activities that I will be posting on this week. Between the garden and end of school year programs I haven't had much blogging time, so I am hoping to spend more time on the blog this week. 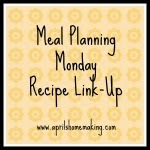 Now its time for Meal Planning Monday Recipe Link-Up! Share your favorite recipe posts, new ones or favorites from your archives. Check out some of our other posts as well as previous Meal Planning Monday's for wonderful meal planning inspiration! I will be sharing my Hamburger Soup recipe this afternoon. I would also like to share a recipe from my archives - delicious classic Pineapple Upside Down Cake, one of my favorites!